Our Committee answers some of your most frequently asked questions. Consider volunteering for us! Find out more about how you can help here. Help us raise funds - nominate us as the charity of the month at your local supermarket or workplace. Find out more here. Spread the word about what we do. We are always keen to hear from new listeners. Like, link and re-tweet us on social media Facebook, Twitter, SoundCloud and YouTube Find out more here. Distribute our leaflets and posters to local libraries, GP surgeries, day centres, nursing homes, community centres, churches and schools. Contribute to our magazine edition by recording an interview or sending us a script to read. Find out more here. We don’t ask our listeners for personal information, but we know from statistics compiled by local authorities that most of the people registered blind or partially sighted in our borough are older people – although this is changing. Many of our first listeners had been born blind or partially sighted. These days more and more of our listeners are people who have lost their sight in later life, usually through macular degeneration. The statistics below show the age profile of our listeners relative to other boroughs in London. Can’t technology do all this these days? Technology is improving and there are all sorts of ways that blind and partially sighted people can access information on the internet, using screen readers or magnifiers or special accessibility software. However not all local news websites or electronic editions of magazines are published in an accessible format. 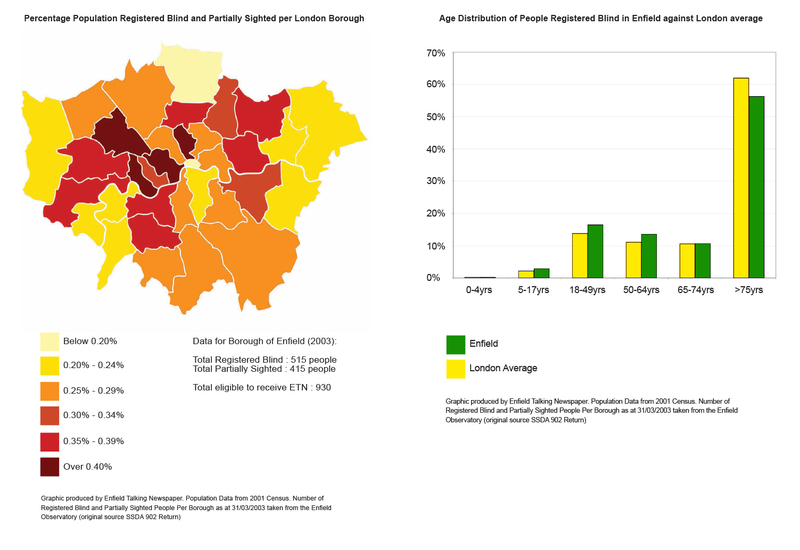 Not all blind and partially sighted people in Enfield have access to a computer and not all listeners appreciate the computer-generated speech – so despite improvements in technology the demand for our service is as strong as it was in 1961. In addition to providing a free weekly local news broadcast, through maintaining contact with listeners (and keeping track of how regularly they are able to return memory sticks for re-use) we perform a useful neighbourly function and are able to keep in touch with listeners, some of whom are housebound and receive few visitors, to check that everything is OK.
What news do you cover ? The Enfield Talking Newspaper is a weekly audio recording of articles from our local newspaper (the Enfield Independent) as well as other local magazines and newsletters, produced for the benefit of blind and partially sighted residents living in the London Borough of Enfield. We also carry events information and notices where these are of interest to our listeners. We do not read out advertisements, property listings or situations vacant but we read out everything else we can! Do you write your own news? No we do not write our own stories for our weekly broadcast - we read aloud articles published in local newspapers and magazines as well as information from clubs and societies that operate in the London Borough of Enfield. However we produce a six monthly "Magazine" which carries original content submitted by our volunteers and listeners. For more information about contributing click here. How do you select which stories to cover? Generally we aim to read every news story published in our weekly local newspaper, the Enfield Independent. We begin with the lead (front page) story. Then we cover a mixture of other news in no particular order - just as you would read if you were flicking through the pages of the paper yourself. Where two publications cover the same news event we use the version that we think has the most detail that will best convey the story to our listeners. Where there is a picture only story or an article carries an image which helps explain the story then our readers will describe this. We read "comment" pieces and letters to the editor that are published in print and online. Where there is a time constraint on our weekly broadcast we seek to ensure that a balance of views is presented in the letters or comment pieces we read where this is possible using the material that has been published. Our readers deliver the stories as written and do not correct grammar or spellings nor do they make any personal comment on the stories covered. How long is the broadcast? Each weekly broadcast is around sixty to ninety minutes, depending on the amount of material we receive each week. On our memory sticks, each story is usually set a separate track which means listeners can easily tab forward and back to hear the stories that are of interest to them. Do you use professional voice-artists? Our charity began with readers visiting their blind neighbours in their homes and reading the newspapers aloud. We now make a weekly recording which is sent to listeners on memory sticks. Whilst we no longer visit each listener personally, we have tried to retain a friendly and familiar feel to our broadcast. Our readers are are all local residents, not trained voice-artists. We work in weekly teams of four readers, so listeners hear a variety of familiar voices each week. Our readers have a range of accents and their ages range from teenagers to those in their nineties. How can you produce the broadcast free of charge? We have no paid staff. Our charity is run and managed entirely by volunteers. Around 35 volunteers help produce the Talking Newspaper each month each taking on a separate role for a few hours a week. We have no premises or a studio of our own. Enfield Council kindly let us use their premises out of hours to record and produce the talking newspaper. We have no postage costs. "Articles for the Blind" legislation means we are able to send our memory sticks through the post free of charge to anyone who is registered blind or partially sighted. We do have running costs though – each new listener requires around £50 worth of equipment (memory sticks, special re-usable wallets and sometimes a memory stick player). Our annual running costs are around £2,000. We rely on generous donations from individuals and local societies to remain a free-to-access service. Find out more about supporting us through fundraising here.